Philips Head Stainless Steel Type AB Metal Screws, #6 size. Great for mounting LED drivers, fans, etc. 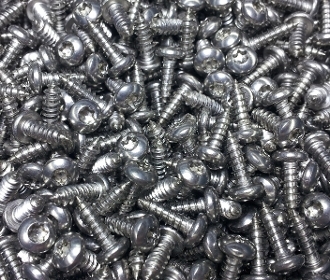 These are marine grade stainless steel screws. They are very strong, and will not rust in a 100% humidity environment. There is no way around it, stainless steel is expensive nowadays. These are well worth it knowing this screw will last forever. The head is a standard Philips Head (#2 head size), with bits being available at your local hardware store. We order 10,000's of these screws at a time so we can get you the best price. We can ship up to 55 of these for only $4.00. These include a special electrically insulating laser-cut fiber washer - perfect for mounting LEDs to our HD Heatsink! No nuts required. Ordering 1 of this item includes 1X screw and 1X insulating washer. It takes 2X screws and 2X washers to mount an LED. This is a #6 size. Works best when using a 1/8" hole. This is a self-tapping screw. Drill your hole and screw it in, very simple. This is perfect for securing drivers, fans, regulators, and LEDs (although Thermal Adhesive is recommended for LEDs). If you have a Philips screwdriver in your kitchen drawer or tool box, chances are that it is the correct size for this screw, very common.